Cleaning a nebulizer is one of the most important steps after using it. Disinfection after every other treatment is also a must. It is highly important for the machine to be clean as vapors from the machine directly enter your respiratory system. The formation of bacteria inside the machine parts is big problem if it is not cleaned after every use. Here are a few steps which will guide you to clean your device completely. Take off the mouthpiece/mask and remove the medicine container. Wash with hot water and mild liquid soap. Rinse off the soap by washing with hot water. Drain the extra water and reconnect the medicine container and mouthpiece/mask to the compressor. Turn on the device to air dry the medicine container and pieces. Remove the detachable parts (mouthpiece and medicine bottle). Soak them in the solution provided by your medical practitioner or you can use one part white vinegar and three parts hot water as a disinfecting solution. Soak it for one hour or as long as listed on the instructions manual. Detach the pieces and either let them air dry or reconnect and switch on the machine to dry the pieces. The tubing of the device should be replaced on a regular basis as it is not possible to completely clean and disinfect the inside of the tube. Read the instructions given by the health company also as a precaution as many devices have their own way of cleaning and disinfecting. 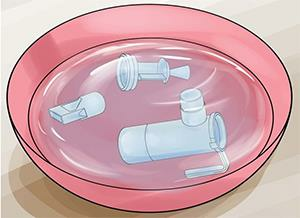 The method of cleaning a nebulizer given above is a general method and is applicable to all normal nebulizer machines. Confirm with your medical practitioner on the method you use for nebulizer care and cleaning.